Fair Vote Canada BC has responded with an open letter to the Urban Development Institute, sent with a press release, which you will find below. Fair Vote Canada BC was disappointed to learn that you received a letter from Anne McMullin, President and CEO of UDI, advising you to vote for first-past-the-post in BC’s referendum. The letter made a number of points that are not borne out by the real-world experience of countries with proportional representation, which we would like to correct. We hope you will pass this on to your staff and encourage them to inform themselves before they vote. UDI is deeply concerned that a move to an unproven PR system would bring lengthy government instability. A study of elections in OECD countries over 50 years showed there was no difference in the frequency of elections between countries with proportional representation and those using winner-take-all systems such as first-past-the-post. Every year, the Fragile States Index ranks countries for fragility. The index looks at 12 measures of stability. The index indicates that nine of the top ten most stable countries in the world use proportional representation. The letter expresses concerns also about economic uncertainty. Yet a study of elections in 100 countries found less economic volatility in countries using proportional representation, providing more certainty for investors than the left-right lurch when governments change with first-past-the-post. Researcher Irfan Nooruddin finds that coalition governments of the sort we find in proportional representation countries produced less economic volatility due to the greater stability of economic policy, meaning to say, less policy lurch when new governments are formed. Nooruddin explains that when a single party controls all the levers of the legislative process, it is better able to enact the policies it wants but cannot guarantee that future governments will not reverse course should the opposition win. This is likely to impact negatively on investment due to uncertainty about future policy. He finds confirmation for this hypothesis based on a World Bank survey of firms across the world, noting that firms located in countries governed by coalitions of the sort produced under proportional representation are less likely to perceive policy uncertainty to be a major obstacle to their businesses and are more likely to invest in those countries. Research shows that countries with proportional representation have higher economic growth, with the best performance by countries with levels of proportionality similar to what would be achieved by the systems on the ballot for British Columbia. Countries with proportional representation have lower taxes for business. Countries with proportional representation have lower tariffs. 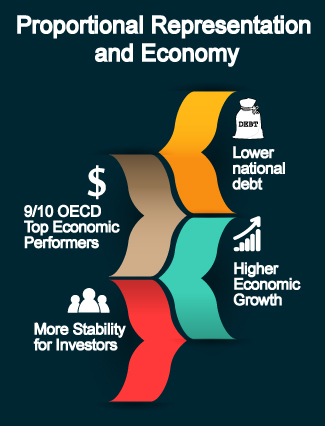 Nine out of ten of the top economic performers in the OECD use proportional representation. The leaders of three BC parties, including the BC Conservatives, are in favour of proportional representation, as are most impartial experts. Thirteen previous independent assemblies and commissions in Canada have all come out in favour of proportional representation. As business leaders, you may be concerned that proportional representation means a lock on power by one particular ideology, but countries with proportional representation are represented by governments of both left and right. What changes is that proportional representation builds genuine majority support for policies. This leads to less policy lurch and less business uncertainty when governments change. We encourage your members to get the facts, and to vote in favour of long term stability and prosperity in British Columbia. Fair Vote Canada BC is a non-partisan citizens organization and a registered advertising sponsor in the BC referendum. Alfano, M. & Baraldi, A. (2015). Proportional Degree of Electoral Systems Growth: A Panel Test. Rev. Law Econ. 2015; 11(1): 51–78. Ardelean, A., & Evans, C. L. (2013). Electoral systems and protectionism: An industry‐level analysis. Canadian Journal of Economics/Revue canadienne d’économique, 46(2), 725–764. Nooruddin, Irfun (2011). Coalition Politics and Economic Development. Credibility and the Strength of Weak Governments. Cambridge University Press. Pilon, Dennis (2007). The Politics of Voting: Reforming Canada’s Electoral System. Edmund Publishing.